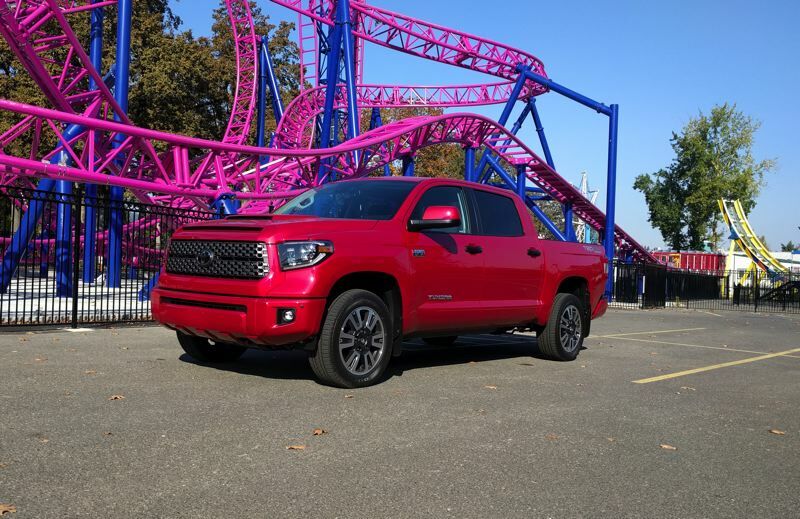 Pamplin Media Group - 2019 Toyota Tundra 4X4 TRD Sport: Best bang for the buck? 2019 Toyota Tundra 4X4 TRD Sport: Best bang for the buck? 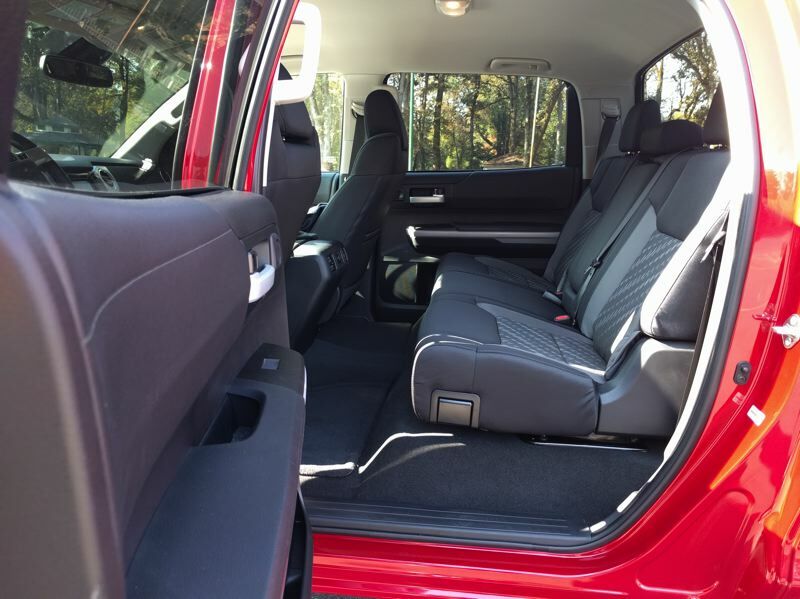 The Tundra is not the newest full size truck on the market, but it offers a lot for a reasonable price. With the economy booming and gas prices remaining relatively low, consumers are flocking to full size pickups, whether they need them or not. Most manufacturers have been quick to respond because they have such high profit margins. Chevy, Ford and Ram (aka, Dodge) are all rolling out new or completely redesigned full size pickups for 2019, each promising to be the biggest, boldest and brashest yet. Nissan brought out its new Titan just a couple of years ago. That leaves Toyota in the unusual position of trailing the pack with a full size pickup that is still worth considering for several reasons. First and foremost, the 2019 Tundra is as large as the competition and well built. It can also be ordered in a variety of trim levels, from the base SE to the TRD Pro 4X4 that returns this year after a one-year absence. But the biggest reason is price. The current Tundra was introduced in 2007 and last refreshed in 2014, an eternity in today's automotive business. But that means Toyota hasn't spent a lot of money that it needs to recover redeveloping the truck lately. 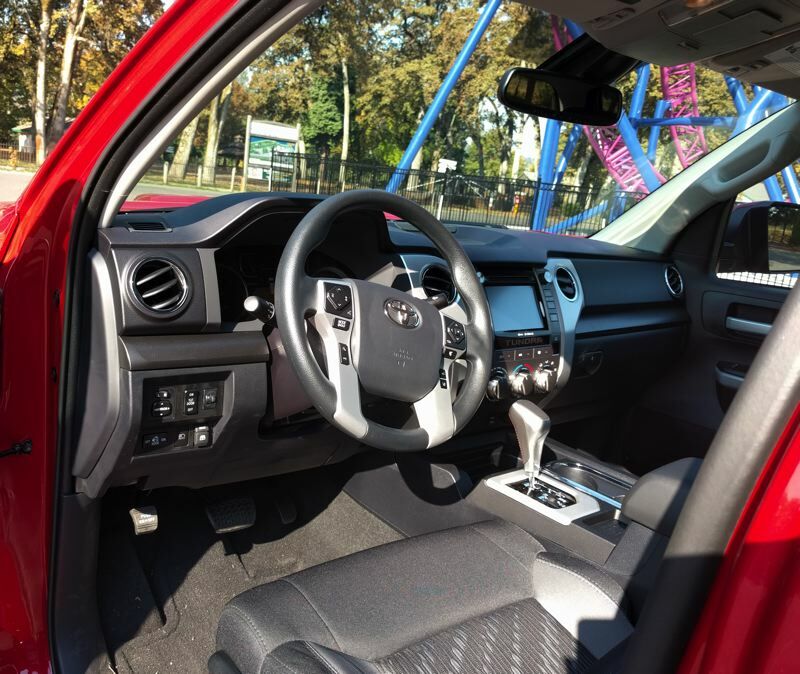 As a result, our well-equipped 2019 Tundra 4X4 TRD Sport only lists for $47,864, despite being a crew max model with a ton of options, including SR5 Upgrade Package and the Entune Premium infotainment system with a backup camera. That's a bargain, just in case you haven't been checking out new truck prices lately. In truth, the new Tundra is not as sophisticated as the competition. Among other things, it only has two V8 engine choices, and the 7-inch touch screen washed out in direct sunlight. The interior also included a lot of hard plastic. But it delivered where it counts, as a full size truck capable of doing real work. The interior was enormous, including the room for three adults in the back seats. The optional 5.7-liter V8 produced 401 foot pounds of torque, which is good enough for quick acceleration or towing up to 10,200 when properly equipped. It's also available with a trailer brake controller to make the towing a little easier. And the ride is reasonable over bad pavement, even unloaded. The Tundra also ranks high in modern safety features, with Toyota Safety Sense P (TSS-P) standard across the board that includes pedestrian detection and collision prevention, along with lane-departure warning, radar cruise control and automatic high-beam headlights. They are definately needed with such a large vehicle, and worked well with our test model. I might argue the lane departure warning was a little too sensitive, but when just a slight sway outside an adjacent pedestian or bike lane could result in serious consequences, I'll live with it. And, in an area that a lot of full truck buyers might consider important, our test Tundra looked great. The front end was especially aggressive, with a blunt nose and low bumper, plus a non-functional hood scoop that looked good, even though it didn't actually increase performance. The alloy wheels were also sharp, although I'd prefer more rubber and tread on the tires because of the slipper conditions in the Pacific Northwest most months of the year. It has to be asked whether everyone buying full size trucks these days really understand what they are thinking. Because it sits so high off the ground, just getting in and out of the Tundra was a challenge. It was also a little unnerving to drive downtown at first, (my last test car was the fun but much smaller Toyota Coralla Hatschback XSE), and I sometimes had to park a few blocks away from my destinations because closer spaces were too small. Plus, according to the EPA, our 5.7-liter V8 equpped Tundra only averages 14 miles per gallon, which makes long trips pretty expensive. Toyota makes a great smaller truck, the midsize Tacoma, which costs less and gets better mileage, if you can live with that. 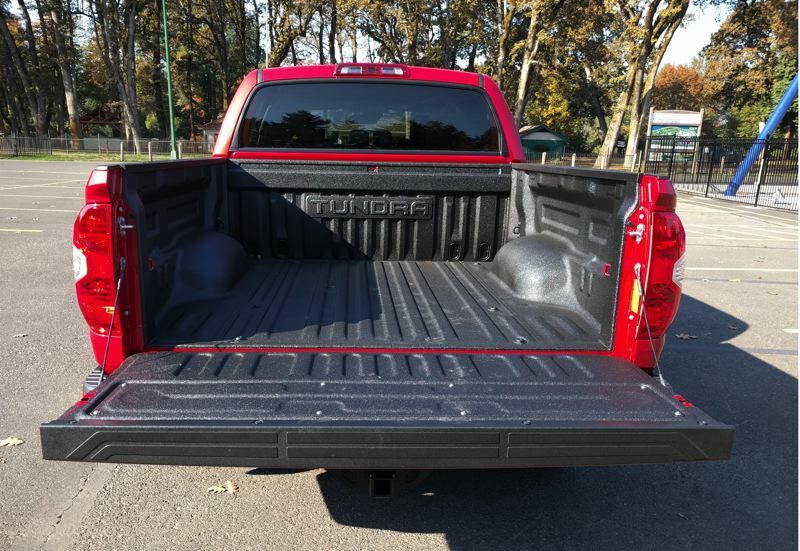 But, if you've just got to have one of the biggest pickups today, by all means check out the 2019 Toyota Tundra. It's one example of where comparision shopping can really pay off. And don't think it's not a real truck because it's Japanese. Tundras are built in San Antonio, Texas.